The following diagram is a functional model of the economy of the late medieval German village. 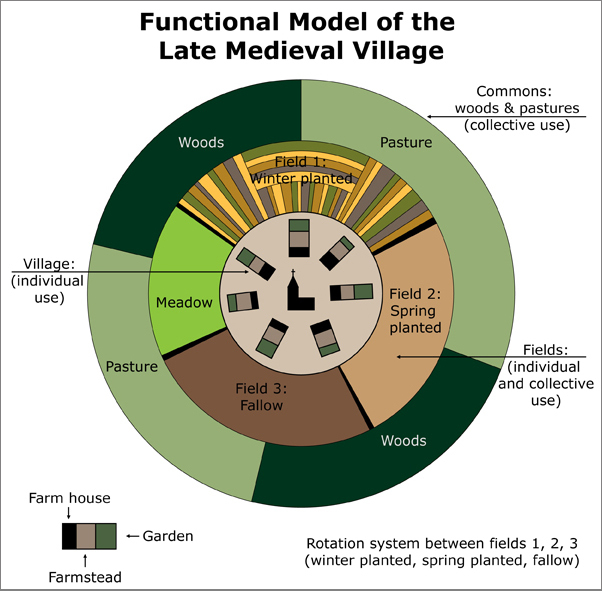 There are three zones: the village (center); arable land, which consists of meadows and fields (inner ring); and the commons, which consists of woods and pasture (outer ring). The arable land is farmed in a three-field rotation. Note that the gardens attached to individual village farmsteads belong to individual households and are thus private, whereas the arable land and the commons are governed by the norms of communal ownership. Source: Peter Blickle, Obedient Germans? A Rebuttal: A New View of German History. Translated by Thomas A. Brady Jr. Charlottesville, VA: University of Virginia Press, 1997, p. 13.